Scientists at the U.S. Department of Energy’s Ames Laboratory succeeded in manipulating the electronic structure of graphene, which could in the fabrication of graphene transistors that are more reliable and faster than the currently available silicon-based transistors. The Researchers theoretically calculated the mechanism by which graphene’s electronic band structure could be altered with metal atoms. The work has the potential to experimentally guide the use of the effect in grapheme layers with rare-earth metal ions intercalated (or sandwiched) between graphene and its silicon carbide substrate. The additions are also capable of modifying the use of graphene for spintronics since the metal atoms are magnetic. We are discovering new and more useful versions of graphene. 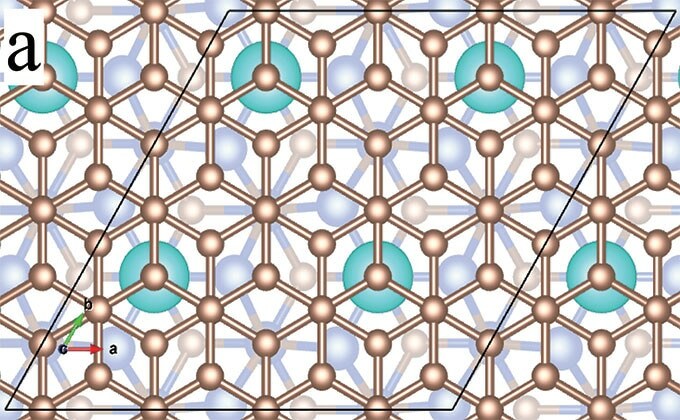 We found that the placement of the rare earth metals below graphene, and precisely where they are located, in the layers between graphene and its substrate, is critical to manipulating the bands and tune the band gap. Since its initial production in 2004, graphene, a two-dimensional layer of carbon, has been widely studied by Researchers everywhere since electrons travel at a much faster rate along its surface, making it a perfect potential material for future electronic technologies. However, the inability to tune or control graphene’s unique properties has been a hindrance to its application. The configurations essential for demonstrating control of the band gap structure were predicted by the calculations of the Density Functional Theory. Ames Laboratory is very good at synthesis of materials, and we use theory to precisely determine how to modify the metal atoms. Our calculations guided the placement so that we can manipulate these quantum properties to behave the way we want them to. Further discussion of this research is available in the paper “Manipulation of Dirac cones in intercalated epitaxial graphene,” authored by Minsung Kim, Michael C. Tringides, Matthew T. Hershberger, Shen Chen, Myron Hupalo, Patricia A. Thiel, Cai-Zhuang Wang, and Kai-Ming Ho; and published in the journal Carbon. The U.S. Department of Department of Energy’s Office of Science supported the work. Computations were carried out through the support of the National Energy Research Scientific Computing Center (NERSC), a DOE Office of Science User Facility at Lawrence Berkeley National Laboratory.